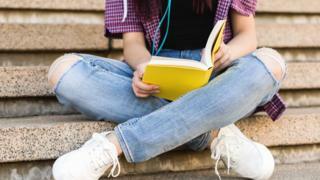 Scottish secondary school pupils are not reading challenging enough books that are appropriate for their age, according to a literacy study. The report found children over the age of 11 across the UK often read with less understanding than primary pupils. Researchers say it means many Scottish pupils sitting their National 4 and 5 examinations at age 16 have the reading ability of a 13-year-old or lower. They have called for reading time to be built into the secondary timetable. The What Kids are Reading Report, involving 29,524 pupils across Scotland, was analysed by the University of Dundee's Prof Keith Topping. It found that secondary school pupils' favourite authors, including Jeff Kinney, JK Rowling and David Walliams, were similar to those still at primary. The study found book difficulty levels rise sharply in the early years of formal education, meaning that primary pupils typically read more advanced books for their chronological age. However, researchers claim this progress stops at about age 11 and the difficulty of books read falls as pupils get older. This decline exists among both boys and girls and across all parts of the UK. Prof Topping said that "to avert a further slide in literacy levels" in secondary schools, pupils should be encouraged to push themselves to read more difficult books. He said: "By their teenage years, pupils are more likely to take advice from their friends and peers than their teachers and parents about the types of books they should be reading. "With this in mind, teachers could encourage them to talk more openly about what they are reading and make appropriate suggestions to their classmates." The study, carried out by Renaissance UK, found that in the final year of primary school, Scottish pupils are reading one year less than their chronological age. This gap doubles by the first year of secondary school. In the later years of secondary school, pupils are reading at least three years below their chronological age and many of the books they do read are no harder than those in primary school. Renaissance UK managing director Dirk Foch said, "The vast majority of primary schools place an emphasis on developing pupils' literacy skills. However, this is rarely continued once pupils go to secondary school. "This makes maintaining literacy levels among teenagers a persistent challenge for teachers and policy makers. "Evidence shows that pupils make the most progress when they read for just 15 minutes per day, so I would encourage all secondary school teachers to build some dedicated reading time into the timetable to avert a further fall in literacy levels among young people."